So you've probably heard this buzzword floating around called "passive income". It may be a mystery to you on how to create passive income and if it is really worth it or achievable. I've had a form of passive income through Etsy for a year and a half and I'm so surprised at how well it has gone. 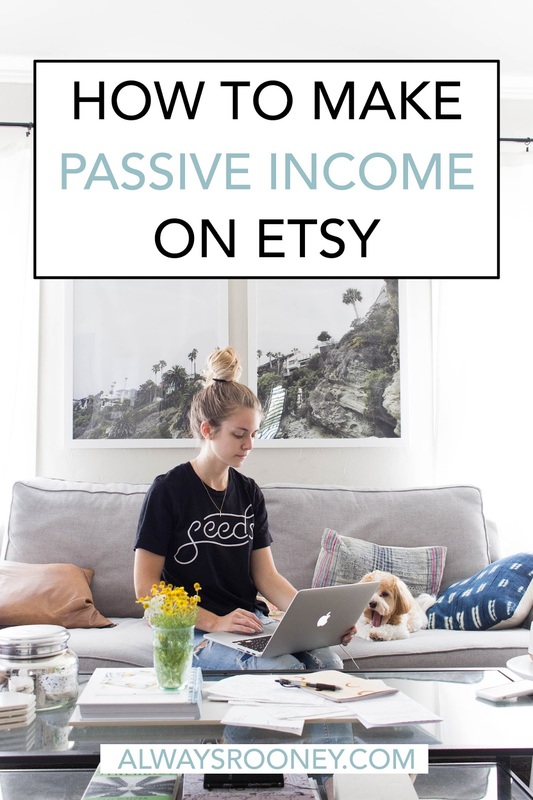 Passive income can take on many forms but today let's focus on how to make passive income on Etsy. I personally sell digital downloads in my print shop for the home. I started with about 50 prints in my shop for sellers to buy at an inexpensive price and print themselves in the format of their choice (for personal use only). This has brought in passive income every month to set aside for savings, and future goals. The good news is, you don't have to just sell digital downloads to make passive income on Etsy. This is where Printful enters. Printful is a dropshipping station that prints your designs on to the format of choice. Think of having your designs on t-shirts, canvases, totes, socks, mugs, etc! Printful makes sure you don't have to have any inventory. None! That means right now you can go upload a design and open a shop for just the Etsy listing fees (less than $1). You choose your pricing model and based off of what you decide to sell your products for, you'll make a percentage of the sales. This can range from $3-12. Up until recently, Etsy did not allow this type of outside shipping or manufacturing source. They recently approved shops to use Printful as their manufacturer which is a huge deal. It also speaks to how well Printful runs as an overall company. I'm currently working on incorporating Printful items into my print shop to expand my offerings. I couldn't wait to share it here on my blog though! -Sell stock photography images: There are so many bloggers looking for stock photography packages they can purchase and use on their blog and social channels. You can take a few hours at your leisure to take photos, edit them and make them available in packages for bloggers to purchase. -Design digital downloads: This can go beyond designs customers can print and hang up. You can also create calendars, day planner sheets, meal planning sheets, to-do list print outs, resume templates and more! Get creative, there are so many options. -Sell Photography Prints: If you are a photographer, you may have never thought about selling your prints. You can do this by offering a digital download for customers to print on their own or you can go through Printful and offer prints, canvases and more! -T-Shirt and Apparel Design: Printful offers many options for apparel to print on, you can even do all-over prints. -Website design: Do you have a knack for blog designs, shop designs, branding, or creating logos? Many people go to Etsy looking for designers to help them with these topics! This is a great way to have templates ready for customers to buy. - Custom photography. If you are wanting to stand out as an Etsy shop, your photos need to stand out amongst all the other t-shirts with quotes on them. I recommend taking your own stock photos and editing in the product (print, t-shirt design, etc). This way, your shop can be trusted by buyers and you can stick with your brand! -Keep a niche. It can be tempting to sell all the things in your passive income shop but from experience, niche shops attract more buyers. So stick with topics like home decor, apparel, photography and play to those strengths. -Remember copyright laws! If you are opening a shop of any kind, you should have a basic understanding of copyright laws and do your own research. This means many franchises, quotes and lyrics are under copyright laws and if you try to sell products with these topics printed on them you can face charges or your item will be removed from Etsy. Just remember: even if it is a popular quote doesn't mean you have the right to print it and sell it. Do your own research and make smart decisions! -Invest time and keep updating. Passive income does not mean you don't have to spend time on it. It actually takes a lot of work to start your shop and grow it. But the amazing thing is when you get a sale, you don't have to do anything else! Which is awesome by the way. Society6- The options of what you can print on through Society6 is seriously impressive. I love the pillows and phone cases! Shopify- Printful is also offered through shopify if you are wanting to sell on a different platform than Etsy. Check out this blog post to compare Etsy to Shopify! These are just a couple ideas because I wanted to focus on how to make passive income on Etsy since I especially enjoy selling on this platform. I hope this helped you realize you can make a shop without a huge financial investment. If you need help growing your Etsy shop, sign up for my Etsy Tips Newsletter! I send out exclusive tips through these e-mails that you can't find anywhere else. Sign up here.